This past weekend served as a nice appetizer with five games involving FBS teams, but the season begins in earnest tomorrow. Our long national nightmare is over for 14 weeks or so. It's the best time of the year. 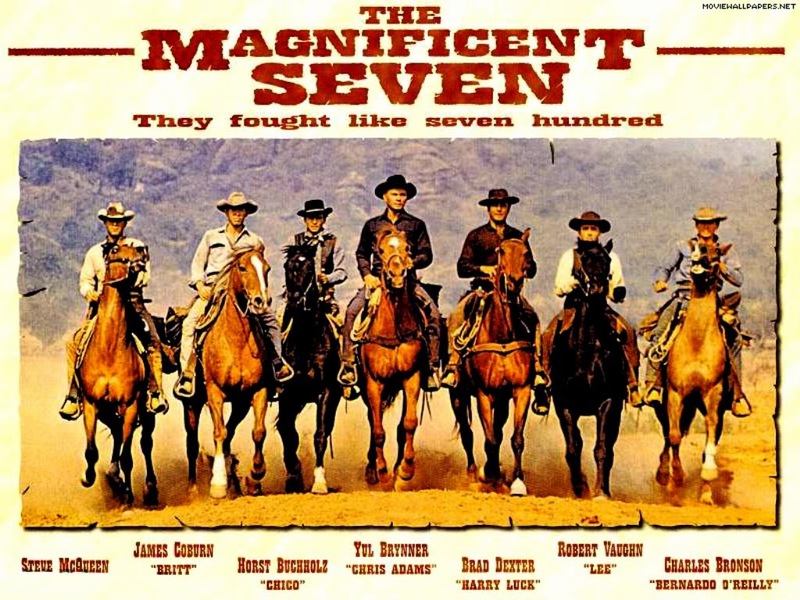 For new readers, this weekly post will outline the seven games I deem as the best options for you to wager your hard earned money on. If you feel so compelled, send a little of your winnings my way. Let's get to it. As always, home teams in BOLD. College football's Week I kicks off in Orlando as Butch Davis looks to rebuild the FIU program. Since firing Mario Cristobal despite two bowl bids after a surprising 3-9 season in 2012, the Panthers have gone just 14-34 with no bowl appearances. Despite the poor record, the Panthers were competitive against teams of similar means. Over the past three years, they have gone 10-14 against Conference USA opponents and 11-17 against fellow Group of Five opponents. They are also an impressive 13-8-1 ATS as a betting underdog against Group of Five teams with seven outright upsets! The Panthers provide what I like to call 'sneaky value' as an underdog. And it just so happens their opponent in the opener is probably a little overrated heading into 2017. UCF rebounded from an 0-12 campaign in 2015 to finish bowl eligible in 2016. Scott Frost brought a fast-paced offense to Orlando, but it was the defense that led the turnaround. The Knights finished last in the AAC in yards per play and second in yards allowed per play. Their record was also buoyed by seven non-offensive touchdowns last season (versus just two allowed). Those events dramatically influence the outcome of a game, but are not consistent from year to year. UCF is the better team, but this spread is too high. Butch Davis is not the only coach debuting on Thursday night. Human amphetamine PJ Flecks begins his Minnesota career after a very successful run at Western Michigan. The Gophers will be coached by a different man for the third consecutive opener. Jerry Kill guided the Gophers in 2015, but his health issues forced him to retire (for a while). His trusted lieutenant Tracy Claeys took over about halfway through 2015 and coached all of the 2016 season before being relieved of his duties. With the team on their third coach in 19 games there are bound to be some administrative and continuity issues. Plus, Fleck will be transitioning the Gophers from a run-first offense to a more balanced spread attack. If his (admittedly short) history is any guide, the transition may be a little bumpy. Fleck's first Western Michigan team went just 1-11 before winning 29 games in the next three seasons. Minnesota has a stronger foundation that the Western Michigan team Fleck took over, so anything less than bowl eligibility would be really surprising. However, expecting the dynamic offense Fleck nurtured at Kalamazoo to materialize immediately is folly. In addition, Minnesota is just 1-8 ATS as a double-digit home favorite since 2014. I know I didn't do a whole lot (or any) handicapping of the Bulls, but trust me, they are a solid play here. Outside of some Eastern Michigan alumni, no one was happier than me to see Eastern Michigan break their three decade bowl drought last season. The Eagles finished 7-5 in the regular season, but were a little lucky to do so, as they went 5-1 in one-score games. 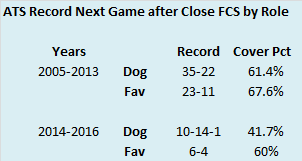 Of course, for a team with Eastern Michigan's history, just playing in some one-score games represented significant improvement. If the Eagles hope to return to the postseason, this game will go a long way toward getting them there. Their other non-conference games are road contests against Power 5 teams Rutgers and Kentucky as well as a road trip to Army. The Eagles will definitely be underdogs to both Rutgers and Kentucky, and a loss to Army would not be terribly surprising. So unless they plan on winning the MAC for the first time since 1987, they need to beat the 49ers to have any hopes of a bowl bid. The 49ers were competitive last season, winning three games in Conference USA, and losing three others by a combined nine points. This was marked improvement from their initial foray into FBS life when they lost all their conference games and came within a touchdown of winning just twice. This will be by far the best team Charlotte has fielded in their brief history and Eastern Michigan should not be a two touchdown favorite against any FBS opponent. Wisconsin has been getting some love lately as a potential darkhorse entrant into the College Football Playoff. The Badgers project to be a pretty good team, but the main reason for this enthusiasm is their schedule. Like Iowa in 2015, the Badgers avoid the projected heaviest hitters from the Big 10 East until a potential conference title matchup. The Badgers do play Michigan (in Madison), but Penn State and Ohio State are nowhere to be found. Their toughest non-conference game is a road trip to BYU, where the Cougars will be coming off a Holy War battle with Utah. They probably won't make it to the end of the regular season unbeaten, but the Badgers are a team to keep an eye on in 2017. They open with a Utah State team looking to shake off a poor, but mostly unlucky 2016. The Aggies finished 0-4 in one-score games in 2016 and their three total wins were their fewest since 2008. The Aggies deceiving record and the ardor surrounding the Badgers has this line about a touchdown too high. This line was about a touchdown prior to Colorado State's home evisceration of Oregon State in Week 0. The final was somewhat misleading as the Rams only outgained the Beavers by about 70 yards and averaged less than a half yard more per play than them. Turnovers were the big difference with the Beavers committing five to the Rams two. However, the big margin did not change this line very much. I was a believer in Colorado State in this game before that one kicked and my opinion has not changed with the small movement in Colorado State's favor. Colorado enjoyed a dream season last year, winning as many games as they had in coach Mike MacIntyre's first three seasons combined (10). The strength of last year's team was their defense as the Buffaloes ranked second in the Pac-12 in yards allowed per play. Alas, the Buffaloes lose eight starters from that unit, which is not a favorable matchup when facing an offense as potent as Colorado State's. Furthermore, while Colorado State might normally be in letdown mode after beating a Power Five opponent while opening their new stadium, revenge will surely be on their mind in this game. Last season, their in-state big brothers pounded them 44-7. The Buffaloes will have their full attention and an outright upset would not surprise me. I know. I know. Initially this line had me thinking the Cowboys might be a good play here, but let me explain to you how I came to my contrarian conclusion. Despite being a double-digit underdog, Wyoming is probably a little over-valued here. The public knows the Cowboys have an NFL prospect at quarterback (that is based more on physical skills than performance as his numbers have been good, not great) and were vastly improved in coach Craig Bohl's third season. What they may not know is that Wyoming has allowed over 30 points per game and finished second to last in yards allowed per play in the Mountain West in each of Bohl's three seasons as coach. The Cowboys did win their division last season, but that was all due to their improvement on offense. Josh Allen returns under center, but as I mentioned, his NFL stock is based on projection. Allen threw 15 interceptions last season and completed just 56% of his passes (89th nationally among qualified passers). In addition, the Cowboys will be without the services of running back Brian Hill (regrettably he is not the former Orlando Magic coach). Hill rushed for over 1800 yards last season after topping 1600 yards in 2015. He will be missed. Allen may yet take a step forward with another year of experience, but the defense will need to improve as well if the Cowboys are to be competitive in this game. In 38 games under Bohl, the Cowboys have allowed both 200 yards rushing and five yards per carry 15 times. Which, wouldn't you know it, fits right into the modus operandi of Iowa. The Hawkeyes will feed running back Akrum Wadley (over 1000 yards at over six yards per carry last year) early and often and should do enough to win comfortably here. The biggest opener of all time? Probably. A potential playoff preview? The college football season always has many twists and turns, so if you forced me to make a bet, I would probably bet against it. Regardless, these are two of the elite teams in the nation and this should be a fantastic game. Give Alabama credit. The Tide have challenged themselves in openers under Saban. Clemson, Michigan, Virginia Tech (twice), West Virginia, Wisconsin, and Southern Cal have all succumbed to the Tide in neutral site openers. For those keeping score at home, that's a 7-0 record for the Tide and a 6-1 mark ATS. So why could this game be any different? For starters, Florida State is probably the best team the Tide have faced in their opener. Clemson, Virginia Tech, and Michigan were in the top-ten at the time (and Clemson was even favored! ), but the Tigers finished outside the top-25 and Michigan finished in the lower reaches of the poll. Virginia Tech did finish in the top-ten, but they were not in the Tide's class. Southern Cal also finished in the top-ten last season, but they were a much different team in January than they were in early September. I agree with Bill Connelly that the passing game will determine the winner here. While Alabama quarterback Jalen Hurts put up fantastic numbers last season, he was limited against good defenses. Alabama played six teams that finished ranked in 2016 (Southern Cal, LSU, Auburn, Florida, Washington, and Clemson). In those six contests, he completed just 56.5% of his passes and averaged 140 passing yards per game. He did contribute on the ground, rushing for nearly 300 yards and five touchdowns in those games, but one would be hard pressed to expect his passing number to be much better against Florida State. The Seminoles had issues defending the pass at the beginning of 2016, allowing 9.86 yards per pass to their first four FBS opponents (they lost two of those games). However, over their last eight FBS games, the Seminoles allowed just 6.0 yards per pass. With nine starters back, including Derwin James who was injured early last season, the Seminoles should be able to contain Alabama's passing attack. Even if the Seminoles win this game, there is probably a loss hanging out somewhere on their schedule with road games against Clemson and Florida (and Wake Forest) as well as home games with Louisville and Miami and a potential ACC Championship Game. All in all, if this game is close, the loser may be able to afford an additional regular season loss and still qualify for the playoff. Look for Florida State to give Alabama their biggest challenge yet in a neutral site opener. As I mentioned last week, three years ago I imparted some gambling advice. Teams that lost to FCS schools should be avoided like the plague in their next game in regards to the point spread. Teams that lost to FCS schools had a cumulative ATS record of 30-33 in their next game. This cover percentage of 47.6% meant that betting against them was nearly right on the break-even mark and provided no value. Has anything changed in the last three seasons? Over the past three seasons, losing to an FCS school has meant positive value the next week. Over 25 games, these teams have covered 64% of the time. What if we further parse the ATS records by role? Underdogs provide pretty much all the value here. 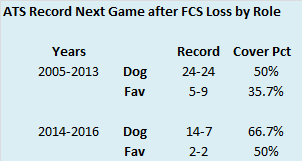 Teams that lose to FCS teams have not been favorites often in their next game. In other news, water is wet. Here are the ATS records for teams in such situations by year with a rolling three-year cover percentage thrown in. Over the past twelve seasons, teams that lose to FCS teams have covered right around the break-even percentage in their next game. The rolling three-year cover percentage has been all over the place indicating this might be a random walk. The next two tables will break out the yearly cover percentage for teams in this situation by their role. We’ll start with underdogs. Underdogs make up the bulk of teams in this situation. Losing to an FCS team probably indicates a team is not very good (though there are some exceptions), so seeing them in an underdog role the next week is not surprising. Underdogs have covered slightly more often than the break-even percentage, but again the three-year cover percentage has been high and low in the last twelve years. What about favorites? Teams that lose to FCS teams have been favored the next week just eighteen times since 2005 (one and a half times per year), so sample size is an issue here. In seven of the twelve seasons, either zero or one team fit the criteria as a betting favorite the next week. If you had bet against the favorites in every game since 2005, you would have turned a decent profit (about 16.7% if you had made equal bets), but the small sample size precludes any valid statistical extrapolation. Finally, to provide a better visual representation, here is a graph of the overall, underdog, and favorite rolling three-year cover percentage. I also included the break-even percentage as a point of reference. If nothing else, the rolling three-year cover percentage seems to be trending upward since 2005. 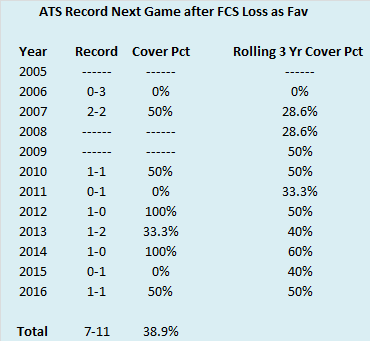 There are a few dips after the peak in 2010, but FCS losers appear to have at least a little bit of value in their next game. As always, handicap each game individually, but don’t outright dismiss a team that lost to an FCS foe. Three years ago in the summer of 2014, I imparted some gambling advice. 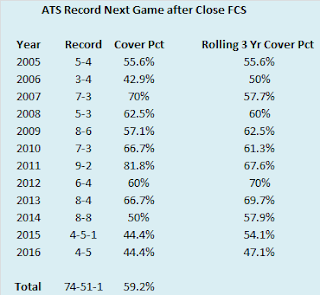 Teams that struggled, but ultimately prevailed against FCS teams were pretty good value bets against the spread (ATS) in their next game. Specifically, teams that beat FCS teams by eight points or fewer (my definition of a close game) covered in their next game more than 63% of the time since 2005. Has that trend continued in the last three seasons? The short answer is ‘no’. In a much shorter time frame and over a much smaller sample, the advantage appears to have disappeared. What if we further parse the ATS records by role? 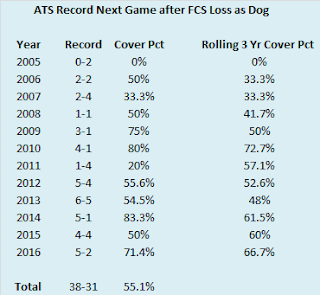 When these teams that struggle with FCS teams are underdogs the next week, they have performed poorly ATS. Favorites have remained a positive value, but in a sample size of just ten games, a shift of one game in the other direction would wipe out all the value in backing these teams. Is this shift in value a sign that Las Vegas bookmakers have been anxiously following this blog and manually adjusting their numbers due to my advice (obviously) or is this just a random blip in an otherwise solid trend? Here are the ATS records for teams in their next game after winning a close game against an FCS team by year with a rolling three-year cover percentage thrown in. In the past twelve seasons, teams in this situation have finished above the gambler’s break-even percentage (52.4% assuming -110) eight times. However, three of the four instances of teams not finishing with cumulative ATS records above the break-even percentage have occurred in the past three seasons. The rolling three-year cover percentage has also declined for four straight seasons and is the lowest it has been in this time period. The next two tables will break out the yearly cover percentage for teams in this situation by their role. We’ll start with underdogs. Seven seasons of finishing above the break-even percentage are sandwiched around five seasons of falling below it (two in the beginning and three at the end). 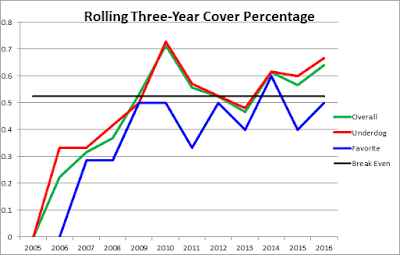 Overall, underdogs have still been slightly valuable over the past twelve seasons, but as in the aggregate, the rolling three-year cover percentage has declined for four consecutive seasons. What about favorites? Favorites have finished above the break-even percentage in nine seasons, but there tend to be fewer teams in this role (about 3.7 per year versus 6.8 for underdogs). 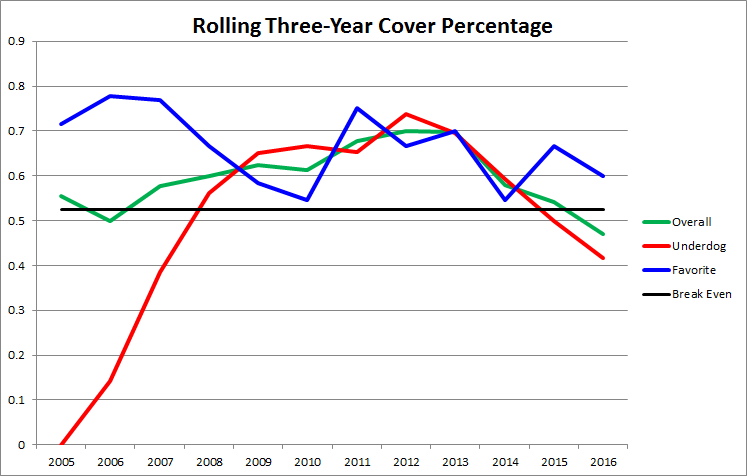 The rolling three-year cover percentage has never fallen below the break-even percentage. Finally, to provide a better visual representation, here is a graph of the overall, underdog, and favorite rolling three-year cover percentage. I also included the break-even percentage as a point of reference. So what can we conclude from all this? A lot of data goes into creating the spread for football games. Casinos and bookmakers don’t typically lose money over the long run. This ‘trend’ of teams that struggle with FCS teams providing value in their next game could be a random blip. I did not look at an extremely large set of data. Even with twelve seasons worth, the number of observations is just 126. On the other hand, perhaps this three year period is the random blip in an otherwise solid trend. Or on a third hand, perhaps linemakers (without reading this blog) discovered this market inefficiency and have worked quietly over the past few years to correct it. Regardless, I am always fascinated by the point spread and this will be an area I follow closely not only in 2016, but for the rest of my football watching life. 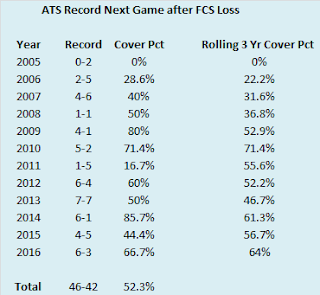 Three years ago, I also included ATS information for teams that actually lose to FCS schools. Have those trends changed in the past three years? That’s what we in the business call a ‘tease’. Tune in next week to find out. Ever looked at the final AP Poll rankings for a particular year (say a year you don’t remember well thanks to drunken tailgate shenanigans) and thought: Man, [insert team name] was overrated. Or vice-versa. Have you ever scoured the final rankings and though: Man, [inserted team name] was ranked that low? I have. Many times. And, in the interests of being somewhat scientific, I wanted to quantify whether a team was ranked too high or too low in the final AP Poll. To do that I looked at the final AP Poll ranking of every Power 5 team since 2005. I then ran a regression analysis based on their record and final poll position. This regression spit out a formula. I used this formula to reverse-engineer the poll ranking of all the ranked Power 5 teams and determined which teams were the most over or underrated. If you want the results, skip on down, but I wanted to give some background and caveats before delving into them. I only looked at teams that were in either the ACC, Big 10, Big 12, Pac-10/12, or SEC during the season in question. The Big East, with future Power 5 members Louisville, Pittsburgh, Rutgers, Syracuse, and West Virginia, was a BCS conference during this time frame, but I left those teams out when they were Big East members because I thought it would skew the results. Similarly, when Utah and TCU were Mountain West members, their final rankings were not included in this analysis. Other current mid-majors like Boise State, BYU, and Central Michigan were also left out. The regression analysis produced an R squared value of .7868 between winning percentage and final ranking with a regression formula of: -74.675*(win %) +71.347. 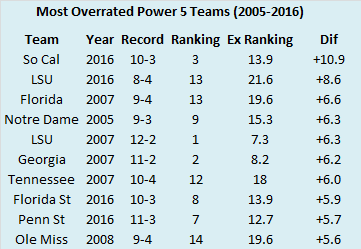 With that out of the way, here are the top-ten most overrated Power 5 teams since 2005. In this analysis, teams tended to be overrated in bunches. 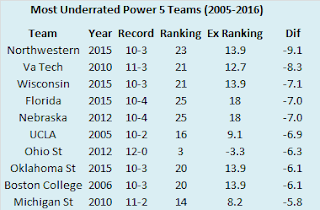 The 2007 and 2016 seasons produced eight of the top-ten overrated teams. In 2016, pollsters were chomping at the bit to rank Southern Cal in the top-five despite the Trojans not winning their conference and losing by 46 points to Alabama. Southern Cal did close the year by winning nine consecutive games, with seven coming by double-digits, but if Arizona had a similar resume, I doubt they end up third in the country. Other notables from this list include last year’s LSU who are dinged by missing out on an assumed victory over South Alabama that would have given them nine wins, Tim Tebow’s Heisman winning Florida Gators (along with three other SEC teams from 2007 including that year’s national champion) who lost to a team that lost to an FCS team, Charlie Weis’ first Notre Dame squad, and another pair of teams from last season that lost blowouts, but closed the season strong. 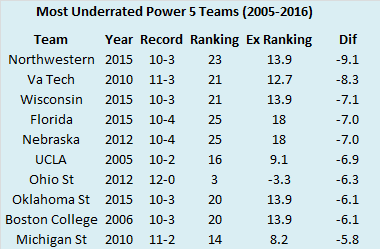 And here are the most underrated Power 5 teams since 2005. Keep in mind, in order to make this list teams must finish ranked. So these teams finished ranked, but probably should have been ranked higher. A rational explanation can be given for the relatively low finish for most of these teams. 2015 Northwestern won a lot of close games, but was blown out in their bowl game. 2010 Virginia Tech lost to an FCS team and was blown out in their bowl game. 2015 Florida won a weak division. 2012 Nebraska gave up 70 points in their conference championship game and then lost their bowl game for good measure. 2012 Ohio State was banned from the postseason. Undefeated teams also throw the model off as only four teams in addition to Ohio State have finished unbeaten (Texas 2005, Alabama 2009, Auburn 2010, and Florida State 2013). 2015 Oklahoma State was blown out in the Sugar Bowl in the last hurrah for Ole Miss. 2006 Boston College played in the ACC in 2006. You get the idea. And finally here is a list of teams that probably should have finished ranked based on their record, but ultimately did not. 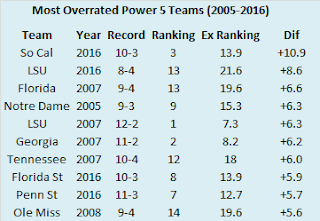 This is basically a list of every Power 5 team since 2005 that finished either 8-4 or 9-4 and did not factor into the final polls. 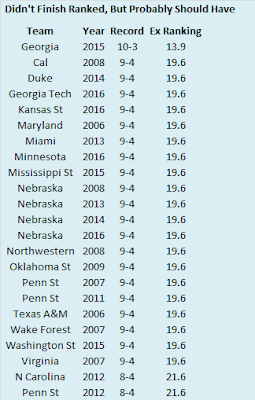 Some of these teams are non-traditional powers that enjoyed solid seasons (Duke, Maryland, Minnesota, Mississippi St, Wake Forest, Washington State, and Virginia), but others are a little more curious. Not sure which pollsters’ wife Bo Pelini slept with (all of them? 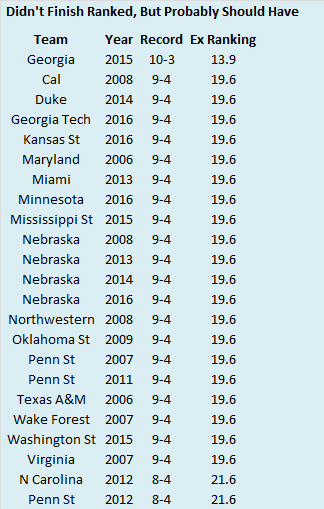 ), but Nebraska finished unranked three times during his tenure despite 9-4 records. That bias also carried over to his successor. Pollsters may have been rankled by curmudgeon (and later sexual assault enabler) Joe Paterno as his teams finished unranked twice despite 9-4 records. However, the team with the biggest beef appears to be Georgia. The Bulldogs finished 10-3 in 2015 and even won their bowl game, but couldn’t wrangle a ranked finish despite playing in the SEC.